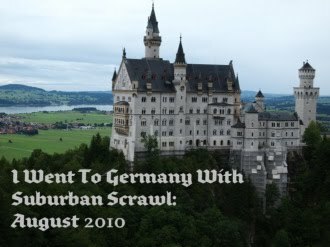 Go On Vacation To Germany With Me, At Your Leisure! Here’s my roundup of Germany posts, all in one place, along with a badge you can grab, if you’d like, to display on your blog! Resize, whatever. (If you link back to this post, even better. If not? I still adore you.) The best part? You don’t even need a passport. I loved all of your posts & am glad that you had a great vacation! Sigh. That was fun. Now all I have left are my memories, this post, the photos and hopefully a visit in the next one or two years.. Thanks for letting me tag a long on your German Vacation. I had a great time. Where to next? Next post: Sending Your Kid To College Is Exactly Like Being Pregnant, But Different. Previous post: Passion For Learning: A Visit To Scholastic Headquarters!